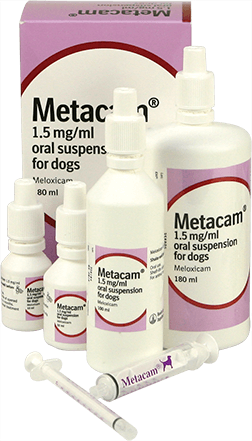 The Metacam dosing syringe is used to accurately control the dose of Metacam oral suspension you give your dog. You should always follow the dosage instructions given by your vet. 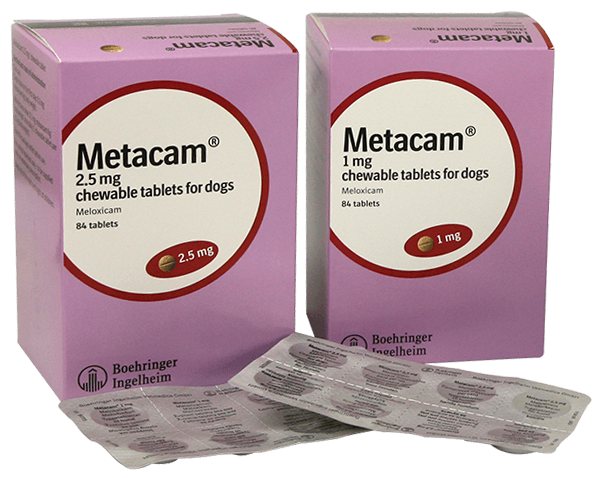 Metacam chewable tablets can be administered with or without food, are meat flavoured, and are taken by most dogs voluntarily. Before administering Metacam you should shake the bottle. Then remove the cap and attach the dosing syringe to the top of the bottle. Once the syringe is attached to the bottle you can turn both the bottle and syringe upside down. Pull the plunger out until the black line is aligned with your dog’s weight in kilograms. Then turn the bottle the right way up and twist to separate the syringe from the bottle. Push the plunger to empty the syringe onto your dog’s food. Alternatively, empty the syringe directly into their mouth. For small dogs weighing less than 10 kg, the dropper on the bottle itself can be used. After shaking the bottle, simply turn it upside down, and without squeezing the bottle, allow the appropriate number of drops to fall onto your dog’s food.